Hello again! Did you miss me? I think it is fair to say that 2014 wasn't a great year for blogging. Or photography for that matter. There are a few reasons for this. I have been incredibly stressed out by building work on our house and haven't felt like writing happy posts and looking for pretty pictures. I lost my way with photography after I realised I was never going to be a professional photographer. And also I found a new hobby - running - and all my energy got caught up in that. So what's changed? Well I have realised I miss my little blog. I miss this space which is pretty much a happy and smiley place. I miss photography too. Just because I am not going to do it for a living ever doesn't mean I can't try to take nice pictures for my own, and hopefully your, pleasure. And finally I hurt myself this week. A stupid injury in a soft play centre. I am just bruised and I think I am healing fairly quickly but it means I won't be able to run for a little bit. This is so annoying as I love it so much. I just want to put my trainers on and get out there. I guess I should be grateful that if I have to miss a week or so of running it's a week when the weather is horrendous! Anyway, it has made me realise that I shouldn't put all my eggs in one basket. I can have more than one hobby. It's not like blogging is cheating on running! Plus it gives me another place to try and not be too much of a running bore. Here's a photo from summer which I never got around to sharing here. 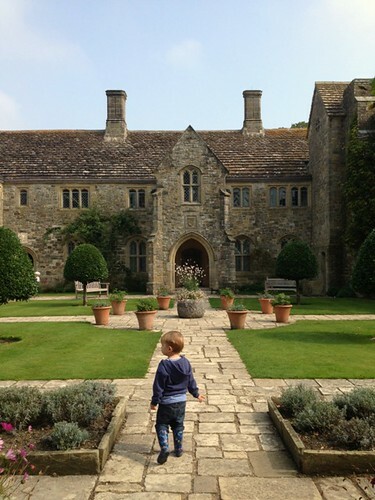 It's of my son at Nymans in West Sussex. I haven't actually got much to say about it other than I really like it and I like that it reminds me of warmer and sunnier times! I hope spring isn't too far away. I love Nymans and I love all your photos. It is nice to see you blogging again. Thanks. I knew I couldn't stay away forever!